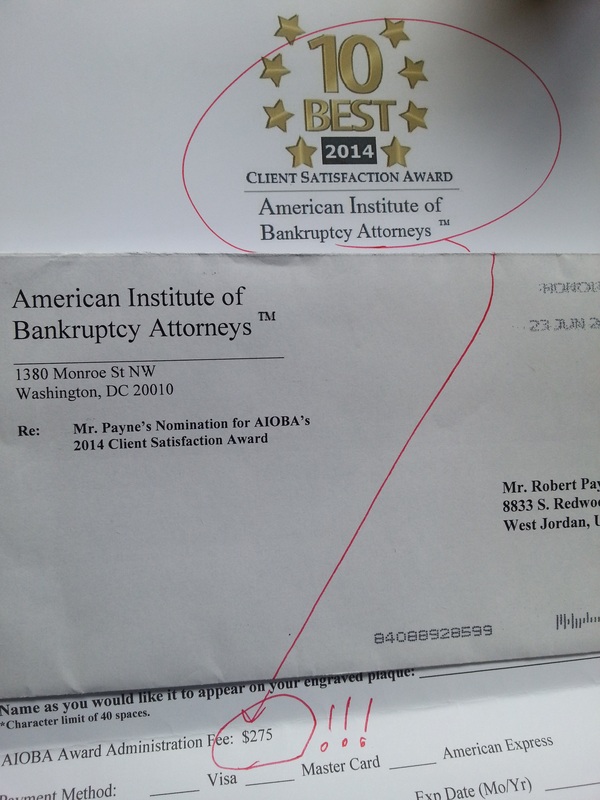 How do you become one of the ten best bankruptcy attorneys in Utah? Apparently, it takes skill, experience, good customer and peer reviews, and $275. 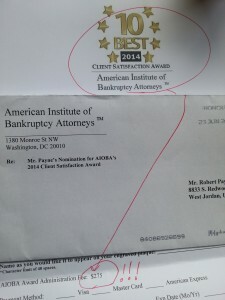 I was feeling pretty good about myself when I received a 2014 Client Satisfaction Award letter from the American Institute of Bankruptcy Attorneys as one of the 10 Best Bankruptcy Attorneys in the State of Utah. The letter stated that I had been chosen based on peer and client reviews, and that really didn’t surprise me much since I do get along with the other bankruptcy attorneys in the state, and I seem to have fairly happy clients. As I read on, I noticed that I would have to pay a $275 processing fee to process my award. Even worse, if I didn’t pay the fee, the nomination would go on to someone else. If he didn’t pay the fee, I presume that it would keep going down the chain until someone finally paid the fee. Then I realized that I may already be the last attorney in the chain! This letter could have gone to 100 attorneys here in Utah before me, none of them paid the fee, and it finally worked its way to me here in the bottom of the barrel. I could be the very last one on the list. This deflated my ego a bit. So to answer the question on how you become one of the ten best bankruptcy attorneys in Utah: it apparently takes a $275 fee, and I am not part of that elite, fee-paying group. This entry was posted in Utah Bankruptcy on August 6, 2014 by robertspaynelaw.